In 2007 UNESCO declared Langkawi and its surrounds, one of 64 globally recognised Geoparks. What is a Geopark I hear you say? Essentially, this means that as well as geological heritage, a Geopark also comprises recognised conservational efforts, local community support and ecotourism. Geoparks are nationally protected areas but, by and large, accessible for visitors to take in their wonder while still upholding the notion of sustainable development. Langkawi�s branding as a Geopark is obvious in its array of impressive rock formations surrounded by ancient jungle, vast caves with stalactites and stalagmites, winding mangrove rivers, sea caves and tunnels, wildlife and waterfalls. As well as these impressive features, environmentally, eco-tourism is promoted in the community with areas such as Laman Padi in Cenang. Here you will find a rice garden museum with an 8.6 acres paddy field, educating visitors on the traditional and modern ways rice is harvested. The cable car ride up to the top of Machinchang Mountain, allows visitors the chance to explore the waterfalls and fauna in the pristine forest below whilst still preserving its natural beauty. 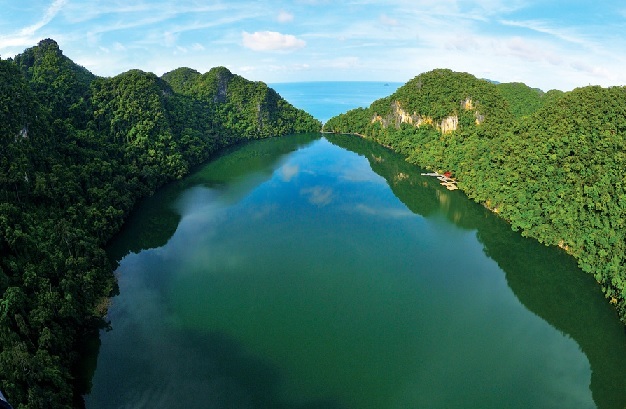 The 99 islands in this region make Langkawi one of Malaysia�s top destinations to visit for natural beauty, ecological harmony and geological significance. You will also find here the most exposed and complete alaeozoic sedimentary sequence in Malaysia. Over 90 geosites have been found in the region but there are three distinct areas that form the Langkawi Geopark, each with its own unique geological makeup. 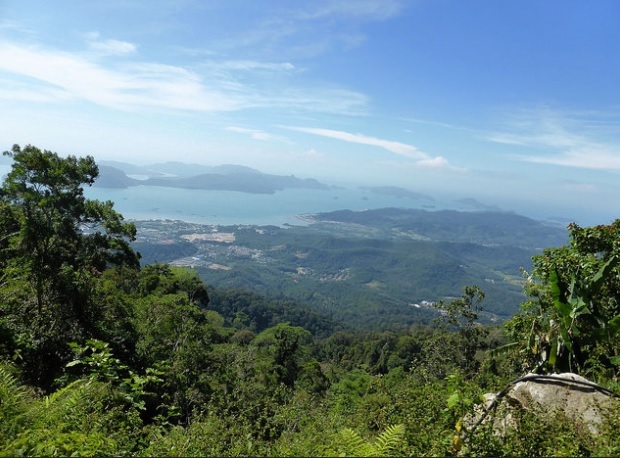 The MaChinchang Mountain Ranges are renowned for their Cambrian (first geological period of the Paleozoic Era) rock formations; the Kilim Geopark for its Karst landscape; and the Dayang Bunting Geopark for its marble formations. 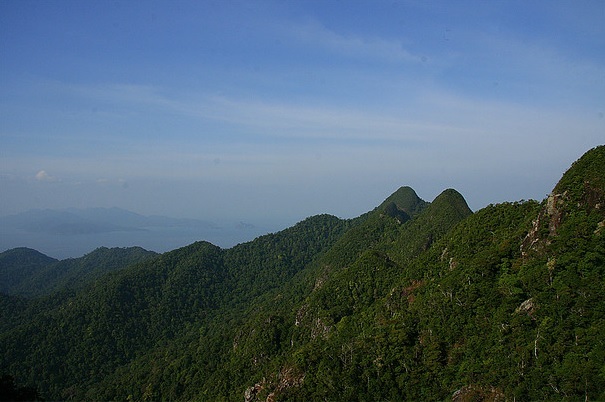 Geologically, the sandstone mountain range of MaChinchang, in the north western corner of Langkawi, and Gunung Raya, a granite mountain at the centre, are a great testament to its classification as a Geopark. Gunung Raya is the tallest mountain range on the island standing at 881m. Machinchang is the oldest rock formation on Langkawi, and stands 800m above sea level. It was created over half a billion years ago and was the first part of South East Asia to rise from the seabed during the Cambrian period. The oldest part of this mountain range is Teluk Datai. This is where the oldest grains of sand rest, its history displayed in the exposed surface of sandstone in the upper part and mudstone/shale in the lower part. The Kilim Geoforest Park in the north east corner, a rugged karstic limestone terrain, offers an array of winding mangrove rivers to explore. These are surrounded by pinnacles of various shapes, near vertical karstic hills and caves formed from millions of years of erosion. Within these caves you will see amazing limestone formations. Here you can find plenty of marine life in the emerald green waters below as well as spot birds, including the islands famous eagles, up high. South of Langkawi you will find the second largest island of the archipelago, Pulau Dayang Bunting. Famous for the fresh water lake found nestled amongst hills of rugged forest, it is also known as Lake of the Pregnant Maiden. The lake originated as a massive limestone cave which collapsed. 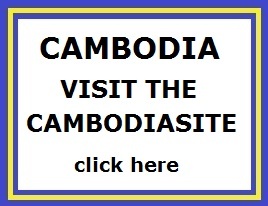 There you will also find the finest Permian marble formations in the world. 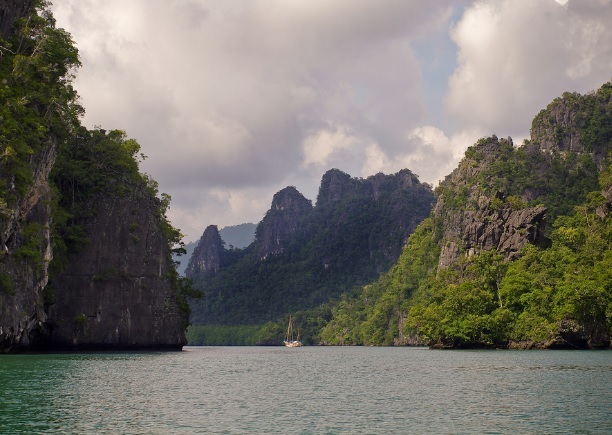 As well as its geological beauty, Dayang Bunting also contains a deep spirituality. Legend tells of a heavenly maiden, married to an earthly prince, who loses a child shortly after the birth. She is said to have buried the child in the lake then blessed the waters with fertility before populated by tourists and locals who come to swim and admire the surrounding landscape. From a certain angle, the shape of the island resembles a pregnant maiden laying on her back. This magical quality as well as the area�s overall astounding beauty is what many believe make Langkawi the number one Geopark in the world. � Please do not feed the wildlife. You are not only disrupting their ecological cycle but, especially the monkeys, they become accustomed to human contact and may become aggressive if approached with food. � Be careful when swimming around the coral reefs. Standing on them is damaging and harmful to the ecology of marine wildlife. Be considerate to Mother Nature; she was here long before you!